This is yet another 3-year-old post pulled from the depths that is my blog post drafts. I had a lot of fun writing that last Custom Doll Stuff post, so I thought I’d write some more about my favorite custom doll ideas. Obviously, I’m not going to make all of these, but a girl can dream! I’m sure that if you’ve been interested in AG for a while, you’ve seen the GOML dolls. If not, click here to learn more about them. Anyways, since Summer 2013 I’ve been trying to find the Kathleen one. We have a lot of similarities and I loved her book. I would really like to make an 18″ version of her. I would give her the Monique “Arielle” wig in carrot. I’m hoping to customize our Ana (Nicki) to look a bit more like canon Ana. I’m going to be using the Monique Roxanne wig in Light Brown. Minerva is amazing. Enough said. If you don’t know what I’m talking about, or haven’t yet gotten to the 5th Artemis Fowl book (The Lost Colony), you really need to read it. I guess it does have a very specific audience, so some people might not enjoy it, but if you’re nerdy, a bookworm, read a lot of sci-fi, and enjoy snarky British humor, you should read it. Anyways, Minerva. Minerva is a 12 year old genius, and she has a lot of similarities to Artemis. I absolutely adore her character, and I thought it would be fun to make a custom doll. She’ll be a bit changed from canon-Minerva, because there really isn’t much of her in the books. Her name will probably be River Minerva Vain, and maybe Minerva River Vain. Anyways, she’ll be a #53 with the Curled Cutie Bavas wig in light blond. I’ll also hand paint some freckles. Obviously, I absolutely would love a Hermione custom. I haven’t found a wig that I like yet, nor have I found a perfect doll. I think we’re planning on going Goblet of Fire for her. I see some Yule Ball gowns in my future. I really don’t know much about this girl yet. She’s just kind of beginning to form in my mind. I don’t know what she’ll look like exactly, though I’m thinking TM #62, and the Glamour Girl wig from Bavas International in Ebony. Grace (actually almost the whole Düeren family) is essentially supposed to be my mini-me. 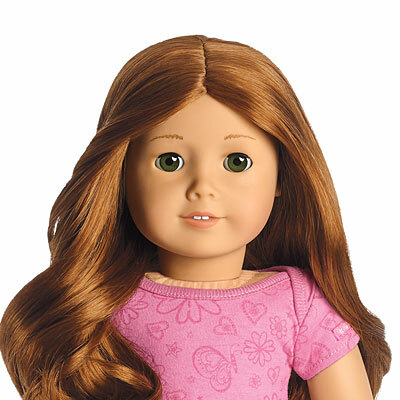 Katelyn (my first doll) is kinda my younger self mini-me, like me at age 8 or so. 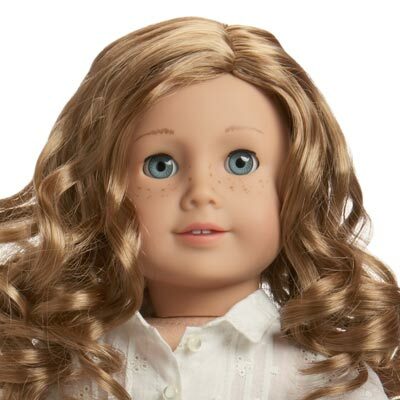 I’ve changed quite a bit since then, so that is why Grace and Marie are my going to be my new mini me-s.
Grace will have the Bavas International Glamour Girl wig in Auburn, painted on freckles, and some possible re-painting. Willow is another Dueren family gal. She’ll be a #35, with a RRG Curly Parting Wig in Auburn. If you could make one custom doll, what would they look like? I love to dream up custom dolls. It’s always been a goal of mine to fully create a custom, from looks to personality to wardrobe. AG may have just come out with a create-your-own feature, but I’d still like to make my own. I decided to start sharing a few custom dolls I’ve been dreaming up — this is my absolute favorite and I’ve been dreaming of her for ages. So, without further ado, let me introduce you to Echo. “Echo” Book 1 — Nine year-old Echo Aria Story Winslow isn’t exactly the most outgoing person ever. She’s loved performing since she could walk, but she has massive stage fright! Will Echo ever learn to share her passion for music and dance? “Echo Steps Up” Book 2 — Echo’s school is putting on a talent show! She’s looking forward to helping on the backstage crew, making sure props are ready, and working on lights. Between that and helping her older sister Holly pack for college, she has a whole lot to think about. When the star performer gets sick the day of the talent show, will Echo find a way to save the day? “Bravo, Echo!” Book 3 — After the success of Echo’s act in the school talent show, a local theatre company contacts her about auditioning for the main role in their upcoming musical. Echo soon enters a world full of tap-dancing chimney sweeps, penguins, and daily rehearsals. But when Echo’s friend Ava becomes jealous of all the attention Echo is giving to her new friends, can anything ever be the same again? Cheesy? Yes. But amusing to write. 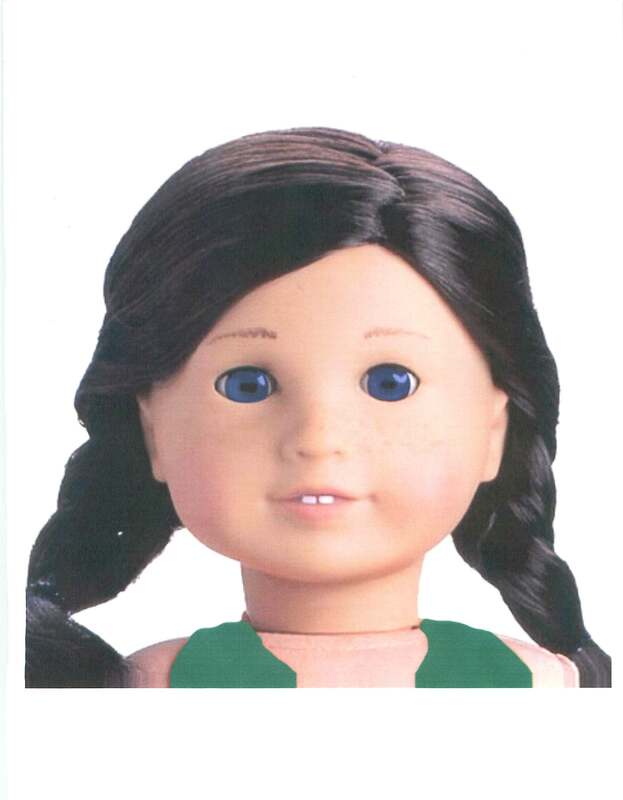 Have you ever made a custom doll? Hello all! I’m back with another “Things I’m Loving”, a.k.a. those times where I talk about everything that is completely eating away my social life. *Responsible for 99% of my lack of a social life. Matt Holt is a gift to humankind. ** I didn’t know it was possible to have five favorite characters that you love equally, but here we are. ***That was a wild ride for every shipper no matter the ship. As of two years ago today, I started my blog. In the past year I haven’t blogged half as much as I’d have liked. I was able to post a few things (and not all doll-focused, yay!) but I’m hoping to get into the routine of posting once a week or more. I’ve gotten about 12,000 views, multiple new followers, and a whole lot of comments. I’ve changed my blog design (thanks, Dad!). It’s been a wonderful year, even when I haven’t been blogging. I just wanted to say thank you to my 14 followers and many blogging friends, and any one who has ever supported my blog.